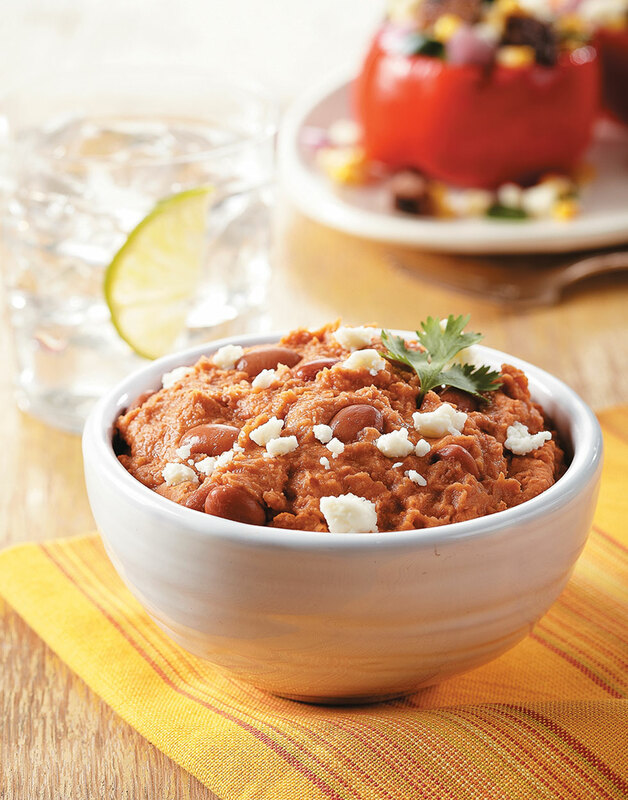 Up the ante with these spicy refried beans. Bacon and reduced salsa give these beans out-of-this-world flavor—you won't be able to stop eating them! Adjust the heat of these beans by upping the spice level of your preferred salsa. Cook bacon in a saucepan until crisp; transfer to a paper-towel-lined plate. Drain all but 1 Tbsp. drippings from pan and increase heat to high. Stir in salsa and boil until liquid is nearly evaporated, about 5 minutes, stirring frequently. Purée half the beans, bacon, and salsa in a food processor. Transfer mixture to a bowl and fold in remaining whole beans. Spread refried beans in a 2-qt. baking dish, cover with foil, and bake 15 minutes. Top beans with queso fresco and cilantro.